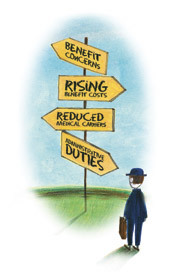 In today's ever-changing world of rising benefit costs, complicated plans, indecipherable terminology, reduced options and greater employee angst, it's no wonder benefit purchasers are having a harder and harder time putting it all together. The options are confusing, the answers are unsatisfactory, and nothing seems to fit. However, there is a solution in your future with Remick Associates. Under the expert guidance of founder/president - Jim Remick, Remick Associates provides employers of all sizes with benefit packages customized to their specific needs, and we can do the same for you.